Note: Water restrictions does not mean you will not be able to install and fill your swimming pool. 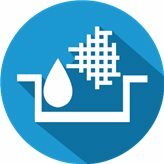 Non-potable water can be delivered via tanker truck at an additional charge in areas that water restrictions of this type apply. 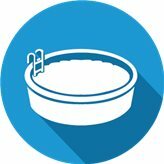 Horizon Pools swimming pool prices are highly competitive and as fair as possible bearing in mind the top quality of the fibreglass pools we manufacture. All our pools meet the NSPI standard so ask yourself this: are you rich enough to buy cheap? 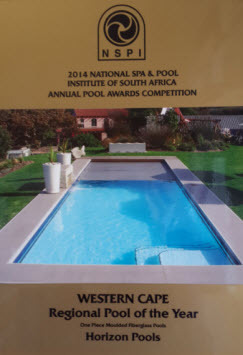 Horizon Pools was awarded the NSPI (National Spa and Pool Institute) ”NATIONAL POOL OF THE YEAR 2014” in the fibreglass pool category held at Cape St Francis, Eastern Cape, on 27th July 2014. We won a total of four Gold awards and one Silver award including the National and Regional pool of the year. 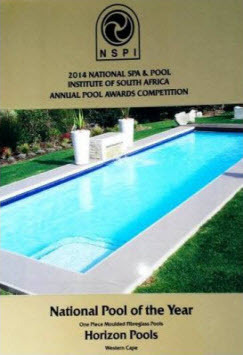 We are extremely proud as this is the first year that gunite and fibreglass pools have been in separate categories and each were awarded a National Pool award. Award winning pool features : 12m x 3.5m Custom shaped pool with automatic pool cover coming out from a cover pit under the timber deck at the deep end. The pool has stainless steel hand rails down both lengths as well as real ceramic mosaics set in on the waterline. It has a self cleaning chlorinator, under water lights, solar heating and a water feature. The tiling around the pool is ceramic tiles with edge coping. There is also a perforated pipe drainage system around the bottom of the pool. Horizon Pools are manufacturers and installers of the largest and best quality range of fibreglass swimming pools Cape Town has to offer. 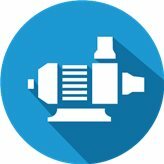 We are well known in the industry for this fact. Our pool shapes and sizes are designed to cover the entire spectrum of needs; such as styles and new shapes, which are introduced as demands change, keeping our range modern and exciting. 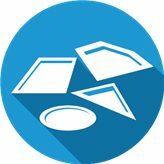 Our fibreglass swimming pools are manufactured in a large, modern, well equipped factory and we work hand in hand with the major resin and fibreglass suppliers to produce a durable product that will last well over twenty years. Since 2000 we have manufactured and installed thousands of fibreglass pools in Cape Town, getting the job done in an efficient and friendly manner. The excitement and change in people’s lifestyles and properties that we see every day gives us great pleasure. Horizon Pools also carries out renovations of swimming pools, pool pumps, fibreglass linings and water features of new and existing pools. We are the first choice of many architects and builders, whose support we appreciate. Horizon Pools also manufacture custom shaped fibreglass swimming pools in Cape Town for those specific needs that our standard range does not cater for such as lap pools or swimming pool designs specially composed for an area. 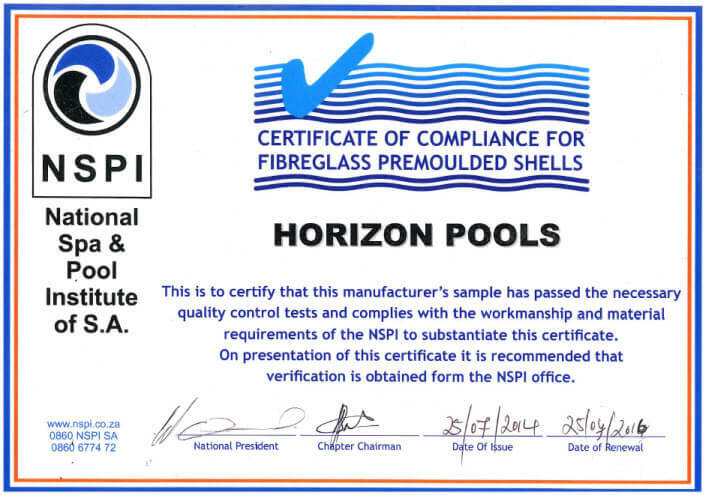 Horizon pools are members of the National Spa and Pool institute (NSPI) whose members must adhere to manufacturing and installation standards. Ask to see this NSPI certificate of compliance which guarantees the fibreglass shell is manufactured to NSPI specifications. Contact Us or more information about our swimming pool prices in Cape Town.